Go Take a Hike - It's good for you body, mind, and soul! In the Pacific Northwest, the spring hiking season is about to get underway. April’s rainy weather makes our local trails muddy and slippery, therefore, we are still a few weeks out. May will bring an influx of adventurous people in boots and backpacks, ready to exercise their bodies and quiet their minds. We both enjoyed reading a recent article regarding the benefits of hiking. The part we especially found interesting is how it impacts our brain. A studypublished in Proceedings of the National Academy of Sciences, finds that spending time in nature significantly decreases negative thought processes. Especially, the type of obsessive rumination that can be difficult to break. In addition, the participants in the study were unplugged as they backpacked through nature. No technology whatsoever! We’re not surprised to learn a nice long hike, without a cell phone, can reduce mental fatigue, soothe our mind, and increase creative thinking. And, once you invest in suitable shoes and a day pack for emergency provisions, it’s free, except for perhaps a parking pass at a trailhead. Hiking also burns calories (400-700 an hour) and builds muscles and bone density. Your body and mind get in shape as nature works its quiet magic. While we agree with the tech-free advice, we think it’s important to carry a cellphone in your pack for emergencies. Peace of mind while you enjoy the peace-and-quiet is also an important consideration. There are many trails in our area for hikers to choose from, and because of our close proximately to the Columbia River Gorge, there are some pretty rigorous hikes for those in good shape. However, you can easily find trails for nearly every ability in Southwest Washington. Here’s a list of hikes in the Clark County Washington Parks system. Here’s a video recap of a hike we took several years ago. 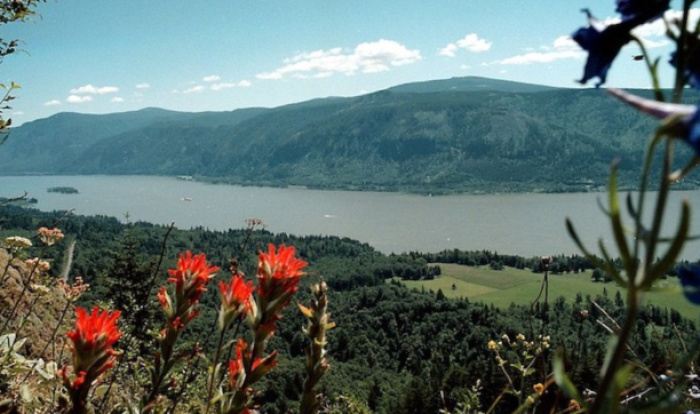 The Cape Horn Loopgives you fantastic views of the Columbia River Gorge. A bonus for us, in the spring and early summer months, a profusion of colorful wildflowers dot the meadows. Keep in mind, the loop is closed between February 1 – to July 15 for nesting falcons. Portions of the trail are quite precarious and exposed, dogs should be on leashes and young hikers should be closely supervised. Do your body and mind a favor this spring – Take a hike!